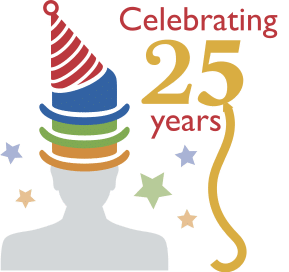 Cambridge Computer celebrated 25 years in business in the summer of 2016! That is a very long time in our industry to remain a viable, independent organization and valuable partner to our clients. We are very grateful to achieve this milestone. Jacob Farmer and Deena Berton founded Cambridge in 1991 in what was then Jacob’s basement. Today we have 77 people in 19 states serving clients all across the US and selected international locations — and we are still growing. Over the years, we have watched our industry expand and change dramatically. We have deliberately grown steadily, responsibly, self-funded, and with a strong commitment to our employees’ careers and happiness; our vendor partners’ success; and our clients’ satisfaction and benefit. We build lasting relationships through investing in our employees, working hard on behalf of our clients, and being sincere and responsible technology evangelists. All our managers have grown up in the company, and our employees have been with us many years longer than the average tenure in our dynamic industry; this consistency of leadership sets us apart. We have clients who have worked with us for years and decades. Serial entrepreneurs, investors, and technologists in the industry routinely seek us out as they move through start-ups and businesses, taking us wherever they go. We look forward to exploring how we can help you with your IT challenges and earning our place as a member of your IT team. Cambridge Computer is a Woman-Owned Business Enterprise (WBE) certified by the Commonwealth of Massachusetts and New York City, a HUB-Certified (W) by the State of North Carolina (not to be confused with Federal HUBZone), and a Women’s Business Enterprise (WBE) certified by the Women’s Business Enterprise National Council. For more details and CCS’s certifications, please contact us. Deena has been at the helm of Cambridge Computer since the company’s launch back in 1991. She possesses the perfect balance of management skills and technical aptitude to guide us through our next round of growth. Deena takes an active role in managing strategic corporate relationships and large professional services engagements. She received undergraduate degrees in mathematics and economics from Cornell University and earned her MBA from Cornell’s Johnson School of Management. Jacob Farmer is the Chief Technology Officer of Cambridge Computer, a position he has held since co-founding the company in 1991. Jacob has been a familiar face in the data storage industry for over 25 years. He has written for a number of trade publications and has been a featured speaker at many conferences and educational events, most notably USENIX, LOPSA, and SNIA. In the data storage industry, Jacob is best known for authoring best practices on enterprise data protection and for helping numerous early-stage companies define their target use cases and establish their first customers. In academic circles, he is highly regarded for his work in defining best practices to manage the life cycle of scientific research data and for identifying novel solutions to reduce costs and streamline operations related to digital preservation. Jacob is a graduate of Yale University. Steve Odio has been the Chief Operating Officer of Cambridge Computer since he joined the company. He oversees operations, accounting, human resources, and professional services. Before settling into the data storage industry, Steve made polymers at Dow Chemical in Michigan and orange and pineapple juice in Costa Rica. He received his undergraduate degree in mechanical engineering from Cornell University, a master’s in chemical engineering from MIT, and an MBA from Harvard Business School.